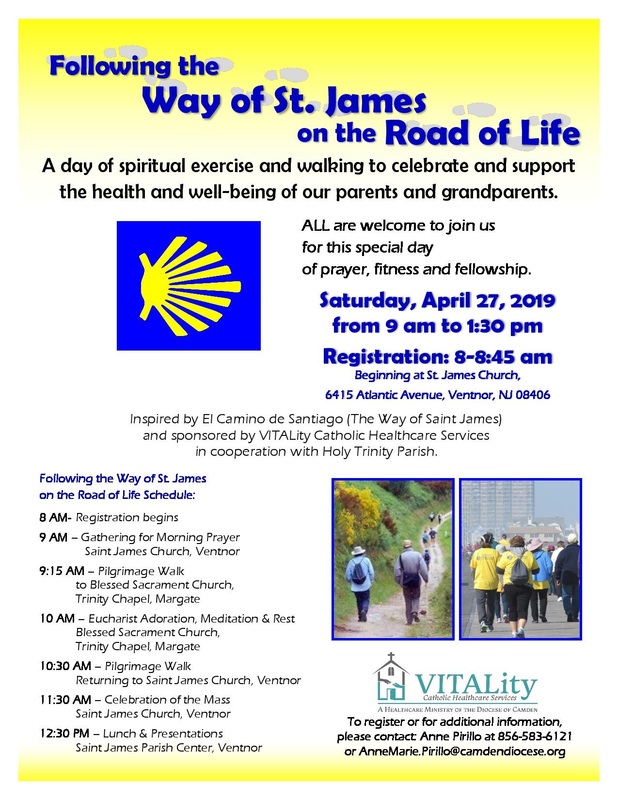 Following the Way of St. James on the Road of Life, a day of spiritual exercise and walking to celebrate and support the health and well-being of our parents and grandparents, Sat., April 27 from 9 a.m. to 1:30 p.m., beginning at St. James Church, 6415 Atlantic Ave., Ventnor. Inspired by El Camino de Santiago (The Way of St. James) and sponsored by VITALity Catholic Healthcare Services in cooperation with Holy Trinity Parish. To register or for more information contact Anne Marie Pirillo, 856-583-6121 or Annemarie.Pirillo@camdendiocese.org.